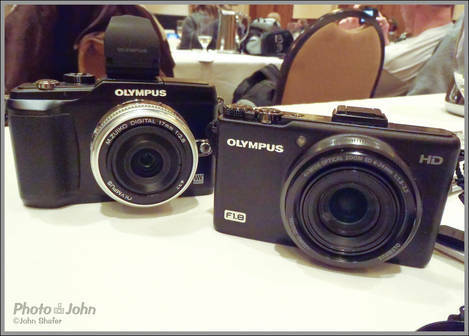 A photo of the Olympus E-PL2 Pen and the XZ-1 premium compact camera. This was taken with the new Olympus Tough TG-610 waterproof, shockproof point-and-shoot camera. I shot it at ISO 800 in very poor light at an Olympus event, just to see how the image quality would be. This isn't the kind of conditions the TG-610 would typically be used in - it's an outdoor camera. But it's still good to see what happens since we never use a camera only the way it's supposed to be used. I think this is ok - definitely not awesome. But it works. If you look at the larger version (click on the photo) you'll see the heavy noise reduction applied in the camera.